I've been posting over at Galactic Hunter for a while but I just saw a link to this web community. It looks like you have a very active Customs group. I thought I'd share some of my custom creations. I just started customizing figures this year (about 6 months ago). I've been having a blast with my new hobby. 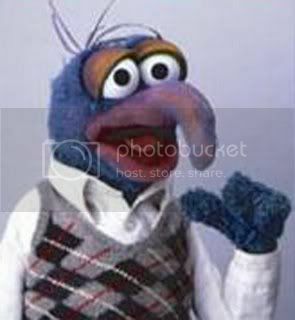 I've been getting a lot of advice from Gregorbian and others at the GH site. These were made before the actual figures became available. I've got more in the works. I've actually sold and traded away several of my original customs. Its been a good way to break into the hobby as it helps cover some of the bills when starting out. Welcome aboard and what a great introduction! You have excellent painting skills. Welcome aboard. Did those red and blue clones start out painted red and blue or did you start from scratch? Nice Fox. As Phruby and Anton said, welcome aboard! Any friend of Gregorbian's is a friend of mine. 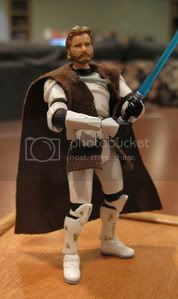 These are some great custom clones, especially since you just started customizing - simply amazing. You already look like you have the skills of a veteran customizer. 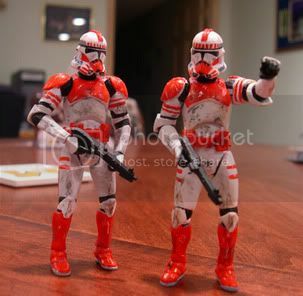 The paint applications are very well done, especially on the Shocktroopers and the 501st clones. 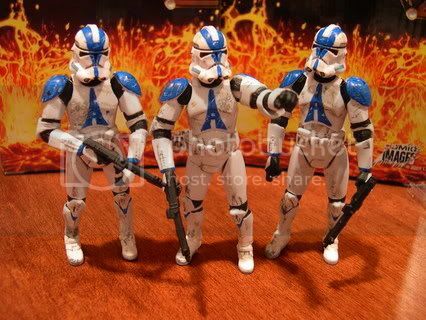 I think your 501st ones look much better than what Hasbro put out. Again, welcome here, make yourself at home, check out some of the other threads here and the photonovel section up above too. Feel free to keep showing your work and let us know what you think of our stuff too. 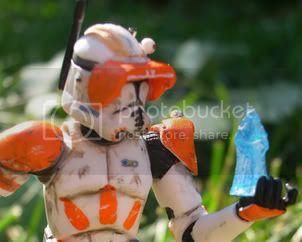 Nice Shock troopers and 501st, you obviously have painting tallent. Thanks for all the compliments. To answer Mr. Phruby's question, all of those clones started out at #41s and were made before the Jedi Assault, Tactical Ops, or Shocktroopers were officially released. I used to paint a lot in high school but I really got away from it. I went to Celebration III this year (my first SW fan convention) and was really really intrigued by the customization and diorama exhibits. I knew I wanted to take a crack at it when I had the time. I've also done some playing around with Sculpy (Cody's Visor, various packs and pouches) and even casting resin parts (Fox's helmet). I've got a lot of ideas but not a lot of time to work on them. Thanks again for the compliments. The skills I see on this forum are amazing. For someone that is color blind, I'm even more amazed - for the record, all of your colors look perfect. pretty cool I like the troops and jedi! I think the shocktroopers are my favorite though. You did the hip lines really well. can't wait to see that vos finished. Welcome to the boards!!! I can't wait to see what else you have coming up! Good work. 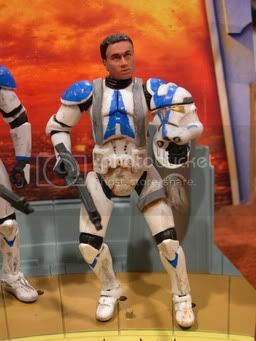 All the clones look like production figures, though the 212th airborne trooper seems odd. I'm a fan of all your customs, save for the attempt at Vos. He looks bad to me, is all. I think you would have better results if you got a different head, and tried somthing that way. 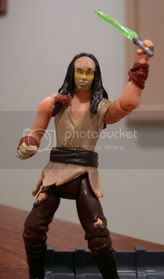 Maybe also sculpting the bands he has on his hands and hair as well. I actually sold this Vos on eBay a while ago. But I think you are right. Thyere is something off about the head/hair. I still like the choice of Agen Kolar but I needed to add some more hair to the front - like bangs or something. I'm going to try this guy again sometime. I was happy with the choice of the clone wars Anakin body but I should also add some "weathering" to him too so that he really looks like he was through the Wars. Thanks for the honest criticism. No problem. Honesty comes by the truckload here at JediDefender. first of all welcome aboard! 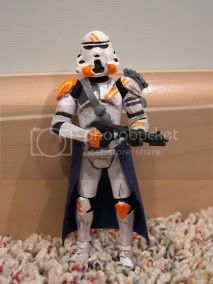 the shocktroopers and 501st look amazing as everyone else said. the weathering is nice and the lines are clean and crisp, especially the chest design on the 501st. the colors look great - no one would ever know you are color-blind. the cape on the clone Obi-Wan is a little awkward. i would maybe try sculpting two small little "buttons"/clasps on the outside of the cape to add the "chain" to so it fits the cape a little better. i do like the soft goods addition.